This article is about current politics in Bristol. For the history of local government in the city, see History of local government in Bristol. The city of Bristol, England, is a unitary authority, represented by four MPs representing seats wholly within the city boundaries. As well as these, Filton and Bradley Stoke covers the northern urban fringe in South Gloucestershire and the north eastern urban fringe is in the Kingswood constituency. The overall trend of both local and national representation became left of centre, favouring the Labour Party and Liberal Democrats during the latter 20th century, but there was a shift to the right in the 2010 general election (although this was not reflected in the local elections). The city has a tradition of local activism, with environmental issues and sustainable transport being prominent issues in the city. On 3 May 2012, Bristol held a referendum to decide whether the city should have a directly elected mayor to replace the leader elected by councillors. The result was announced on 4 May. 41,032 voted for an elected mayor and 35,880 voted against, with a turnout of 24%. An election for the new post was held on 15 November 2012, with Independent candidate George Ferguson becoming the first Mayor of Bristol. In 2017 the West of England Combined Authority and Mayor of the West of England were created covering the local authorities of Bristol, South Gloucestershire, and Bath and North East Somerset. Powers include transport and strategic planning for the combined areas. The City of Bristol is a ceremonial county governed by a unitary authority; Bristol City Council. The city is divided into 35 wards, which each elect two councillors for a four-year term. One third of the councillors are elected three years in four, but as only one councillor from any ward stands at a time, two-thirds of wards are competed each election. From 2016, the whole council will be elected every four years. The full council of 70 councillors has ultimate responsibility for establishing the decision making process and approving the Council's budget and policy framework. The council meets at the City Hall (known as the Council House up until 2012). Full meetings are chaired by the Lord Mayor, a largely ceremonial role that does not hold direct power. The Lord Mayor is a councillor, elected annually in May by the council members. The elected mayor (not the Lord Mayor) acts as leader of the cabinet and appoints up to seven councillors as members (six were appointed as of May 2013). The cabinet is responsible for most day-to-day decisions though the elected Mayor retains the right to override cabinet votes. Composition of Bristol City Council since 8th May 2016. The Council has long been dominated by the Labour Party, but the Liberal Democrat party grew strong in the city and took minority control of the Council between the 2005 and 2007 elections. After the 2007 elections, the Labour, Conservative and Green parties then joined forces to oust them and install a minority Labour administration. The Lord Mayor for 2012–2013 was Liberal Democrat councillor Peter Main. In October 2008 the Liberal Democrats won a seat from Labour in a by-election caused by the death of the sitting councillor. On 24 February 2009 the minority Labour administration resigned following a defeat over plans to build an incinerator in Avonmouth, and the Liberal Democrats resumed control. In 2009, the election resulted in the Liberal Democrats taking overall majority control of Bristol City Council for the first time. In 2010 they increased their representation to 38 seats giving them a majority of 6. In 2011, they lost their majority leading to a hung council. The 2013 local elections, in which a third of the city's wards were up for election, saw Labour gain 7 seats and the Green party double their seats from 2 to 4 while the Liberal Democrats suffered a loss of 10 seats. These trends were continued into the next election in May 2014, in which Labour gained 3 seats to take their total to 31, the Green Party built on their success by winning 2 more seats, the Conservative Party gained 1 seat and UKIP won their first ever seat on the council. In another damaging result, the Liberal Democrats lost a further 7 seats. In March 2015, the only Independent Councillor on Bristol City Council joined the Conservatives, bringing their total up to 16. In May 2015, the Green Party continued to increase their number of seats, winning 7 new seats (5 from the Lib Dems and 2 from Labour) and becoming the 3rd largest party on the Council, with the Lib Dems now in 4th. Labour also gained a new seat at the expense of the Lib Dems. The Lib Dem's decline was compounded later that month when one of the remaining Lib Dem Councillors defected to the Greens, leaving the Lib Dems with 9 seats and the Greens with 14. Bristol constituencies following the 2015 general election. After the 2017 General election, Bristol North West swung to Labour, meaning all four of Bristol's constituencies are all held by Labour. The names of parliamentary constituencies in Bristol were changed in 1885 when the original Bristol (UK Parliament constituency) was split into four and they were revised further in the 20th century. There are now four Westminster constituencies that are part of Bristol proper—Bristol West, Bristol East, Bristol South and Bristol North West. Parts of the Bristol built-up area outside the administrative city are covered by the Filton and Bradley Stoke and Kingswood constituencies in South Gloucestershire, the eponymous constituency of North Somerset in North Somerset, and North East Somerset in the authority of Bath and North East Somerset. The last election to the European Parliament from the South West was held on 22 May 2014. ^ "Sustainability: CREATE Centre". Bristol City Council. Retrieved 18 April 2010. ^ "The City of Bristol Mayoral Referendum result". Bristol City Council. 4 May 2012. Archived from the original on 13 May 2012. Retrieved 4 May 2012. ^ "Directly Elected Mayor – What does it mean for Bristol?". Bristol City Council. 4 May 2012. Retrieved 4 May 2012. ^ "Bristol all-out council elections approved by councillors". ^ a b "Decision Making at Bristol City Council". Bristol City Council. 5 December 2008. Retrieved 19 August 2018. ^ "Lord Mayor of Bristol". Bristol City Council. 3 November 2009. Retrieved 19 August 2018. ^ Staff writer (22 May 2007). "Bristol: Council leader battle resolved". BBC News. BBC. Retrieved 18 April 2010. ^ Staff writer (24 February 2009). "Lib Dems take over as Labour quits Bristol City Council". Bristol Evening Post. Bristol News and Media. Retrieved 25 February 2009. ^ "Local Election Results 2010". Bristol City Council. Retrieved 7 May 2010. ^ "Vote 2013: Results for Bristol". BBC. Retrieved 3 May 2013. ^ "Liberal Democrats lose out in Bristol elections". BBC. Retrieved 24 May 2014. ^ "Bristol's only Independent Councillor joins Tories". Bristol Post. Archived from the original on 14 March 2015. Retrieved 12 March 2015. ^ "Bristol city council: Big Gains for the Greens". Bristol Post. Retrieved 8 May 2015. ^ "Greens Gain a Councillor as Lib Dem Defects". Bristol247. Retrieved 22 May 2015. 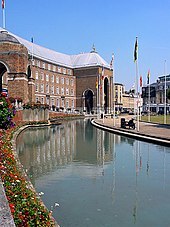 Wikimedia Commons has media related to Bristol City Council. This page was last edited on 19 August 2018, at 15:34 (UTC).